Since I started using Debian as my primary OS, I felt how using Linux facilitated many of my digital activities. And yes, shifting from Windows to Linux wasn’t easy at first. However, after few weeks I began to get the hang of using and customizing it to suit my needs -from utilizing the command terminal to changing the look of my desktop environment-. In this article I will list out some GNOME extensions that I liked and found useful. Additionally, I will provide my current favorite theme as a bonus. GNOME Shell is responsible for the core user interface functionalities. You can customize it by either installing existing extensions or by developing your own. Here are some GNOME Shell extensions every used should have. gTile allows you to tile windows on a grid, and it supports multiple screens! It helps a lot in multi-tasking. When developing web applications, I tile the IDE to the left side of the screen and the browser to the right one. I, sometimes, place the terminal under the IDE. When researching and writing, I tile a word processor to the left side while reading papers on the right side. There are many possibilities you can utilize this extensions with, even for fun usages such as watching a movie while surfing the web and chatting with a friend. Oh.. I hate it when the screensaver starts while reading papers or monitoring tasks. 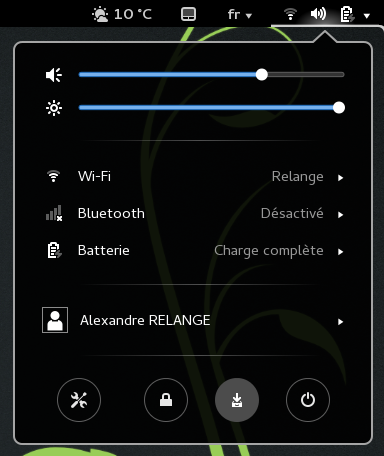 Caffeine provides the ability to disable the screensaver and auto suspend with one click. Breaks are good for your health, Pomodoro reminds you of taking short breaks during your work to enhance your productivity. 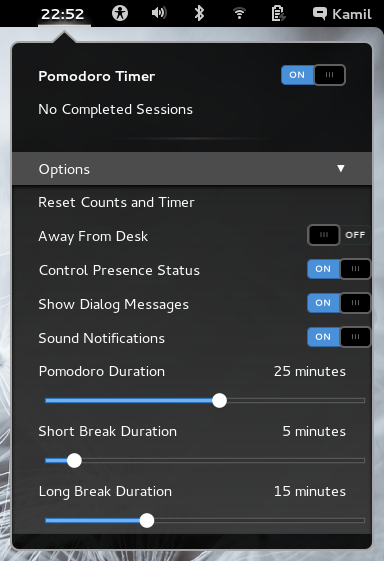 You need to install the application from gnome pomodoro and the extension. The hibernate status button adds a hibernate button next -as the name indicates- to the shutdown button. Alternatively, you can select Hybrid Sleep by using the Alt modified when clicking on the button. 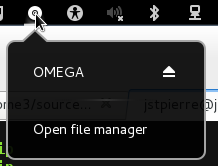 TaskBar extension allows many customizations to the default GNOME task bar such as re-sizing and coloring, separating panels, aligning panels, and controlling what to show and hide. Topicons and TopIcons+ show the legacy try icons on the task bar to facilitate accessing apps. To eject external devices, such as USBs and Hard-disks, easily with two clicks install this extension. User themes extension gives you the ability to customize and personalize your GNOME desktop the way you love by loading themes from the user directory. If you like to see the clock on the right side like I do, frippery move clock extension simply does that. As promised earlier in this post, I will share with you my current favorite theme. This theme customizes the fonts, windows, GTK+, icons, GNOME shell, and wallpaper (of course). 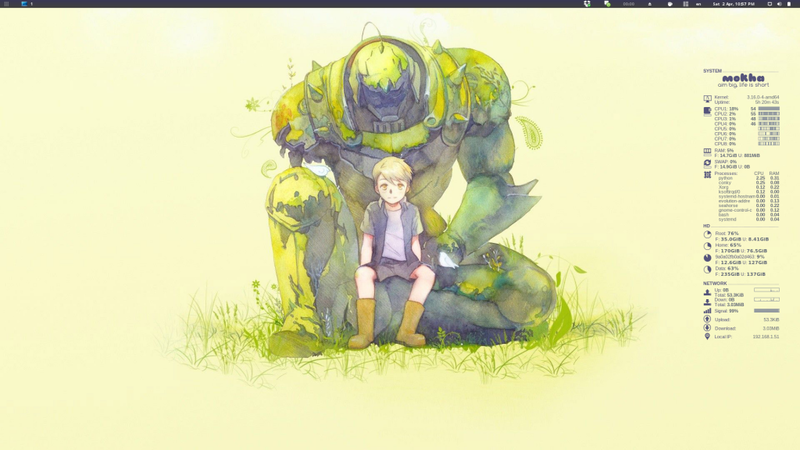 Moreover, I installed and personalized conky. Conky is a free and light-weight system monitor that displays any kind of information on your desktop. Using conky pimps up desktop, and continuously shows you some useful statistics about your machine. There are numerous cool conky configurations. For my conky configuration, I used conky-colors and some parts of segfault’s configuration. You can download the entire confirmation file along with the modified scripts from here. I like robots, and the green colour is a very comfortable colour for my eye. Hence, I choose the “Artist: SHEL” image as my wallpaper. 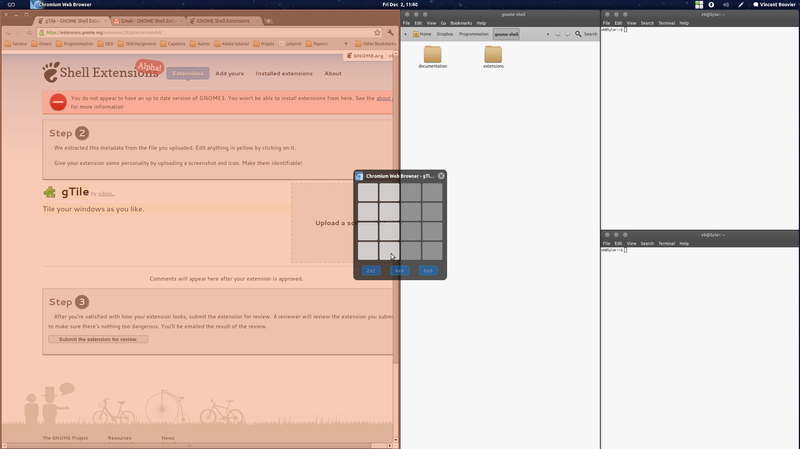 With some tweaking in the GNOME Shell extensions TaskBar, the final result of the theme looks like amazing!